Surrey county council; caused by the resignation of Conservative councillor David Hodge, who until recently was leader of the county council. For our major by-election this week we are atop the North Downs, just outside the Greater London boundary. Warlingham division lies in the northeastern corner of Surrey, and is a division covering a series of villages. The largest centre of population is Warlingham itself; by local tradition its All Saints church was where Thomas Cranmer started to experiment with preaching from what became the first Book of Common Prayer, and there is a stained glass window in that church showing Cranmer presenting the prayer book to Edward VI. In more modern times Warlingham was the centre of a major psychiatric hospital (new redeveloped for housing) and was on the front line in the Battle of Britain as German bombers tried to navigate their way up the local valley towards London. With Biggin Hill and Kenley airfields nearby, that might not have been the wisest move. The division contains some other villages. Farleigh was briefly part of Greater London, joining the London Borough of Croydon on its creation in 1965, but was transferred back to Surrey in boundary changes four years later. Tatsfield, which gets its post from Westerham over the county line in Kent, was the birthplace of the motorsport legend John Surtees, who remains the only driver to win world championships on both two and four wheels. 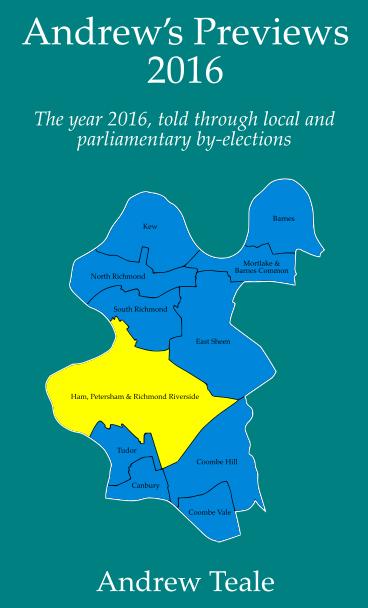 Boundary changes in 2013 brought Woldingham into the division. The Independent reported in February 2000 that a sixth of the residents in Woldingham’s CR3 7 postcode sector were cash millionaires, and the village is a notoriously rich enclave. One of its richest recent residents was the failed parliamentary candidate Katie Price (Stretford and Urmston, 2001) who was reported in 2012 to be worth £45 million. On the other hand, these sort of lists don’t make allowance for what you owe: three months ago Price entered into an Individual Voluntary Arrangement with her creditors, with her debts reported to be around £250,000. Woldingham is home to the only railway station within the division boundary, on the Oxted branch line, and is a heavy commuter area. The village also makes the top 100 wards in England and Wales for the 16-17 age bracket; this is due to the presence of Woldingham School. A Roman Catholic boarding school for girls, Woldingham School’s former pupils include the former Conservative MP Louise Mensch, the BBC journalist Caroline Wyatt and the BAFTA-winning actress Carey Mulligan. This adds up to a safe Conservative division for David Hodge. One of the few councillors notable enough to merit a Wikipedia page, Hodge was first elected to Surrey county council in 2005 for this division, having previously set for seven years on the local Tandridge council. From 2011 until late last year Hodge was the leader of Surrey county council, and in January 2017 he was appointed CBE for services to local government and charity. Shortly afterwards Hodge became embroiled in controversy after the county council planned a 15% increase in council tax, claiming that government cuts and increasing social care demands meant it couldn’t make ends meet. That increase was then reduced to 4.99% amid claims that Surrey had reached a “sweetheart” deal with the government. The shenanigans clearly didn’t have much negative effect on Hodge’s electorate, as he was re-elected in May 2017 with a majority of 56-29 over the Liberal Democrats; a greatly increased majority compared with 2013 when UKIP had run second here. Mind, as part of the ongoing cuts to local government Surrey county council is attempting to close the Warlingham tip and relocate the local primary school, neither of which are proposals which have gone down well in the area. At Tandridge council level the Tories hold five of the division’s eight district councillors; the Liberal Democrats have two out of three seats in Warlingham East and Chelsham and Farleigh ward (and will be hoping for a gain from the Tories there in May) while the small Tatsfield and Titsey ward returns independent candidates to the Tandridge council offices in Oxted. 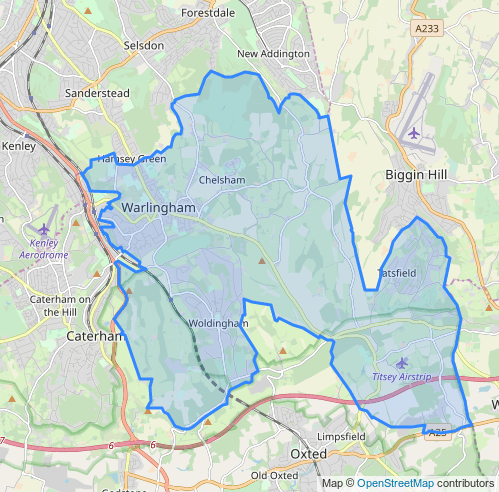 Warlingham West is safe Conservative and Woldingham is ridiculously safe for the party (in 2012 the Tories beat the Lib Dems here by the score of 87-13), but has a low electorate. Defending for the Conservatives is Becky Rush, a Woldingham parish councillor. The Lib Dems have reselected Charles Lister, a Warlingham parish councillor who was appointed OBE in 2003 for his distinguished career in the public health sector, particularly on ensuring a safe blood supply for the NHS; Lister was runner-up in the division in 2017. 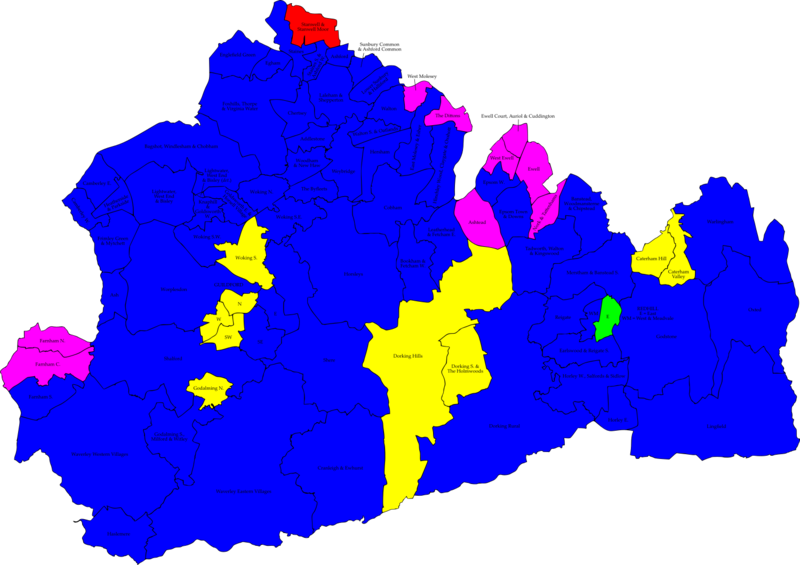 Also standing are Martin Haley for UKIP (who was runner-up here in 2013) and Michael Snowden for Labour. City of London Corporation; an Aldermanic election caused by the retirement of Alderman Matthew Richardson. For our other election we take the train from Woldingham into the centre of London to consider that weird and wonderful elected body, the City of London Corporation. The City has 25 wards of which Billingsgate is one of the smaller ones; the name is evocative of the city’s fish market, but that market relocated to Poplar in the 1980s and its old building is now an events venue. Opposite the old market building is an office block built over the remains of a Roman bathhouse; opposite that office block is the Watermen’s Hall, an appropriate location given that the city’s watergate used to be nearby. Any mention of a watergate will cause politicos of a certain age to prick their ears up for a good story, and Matthew Richardson certainly has an interesting backstory. A former Conservative figure and later Party Secretary of UKIP, Richardson was elected as an Alderman in 2012, despite his history standing as a non-partisan candidate as is traditional in the City. He was associated with the Young Britons Foundation, a now-defunct group of young right-wingers which backed several candidates in the 2013 City elections; none of them did particularly well. In 2012 Richardson was in his early thirties and according to his website was the youngest City alderman for 800 years; outside the Corporation he is a barrister, and presumably is standing down to concentrate on his legal career. So we have a rare open seat in the Court of Aldermen, the senior councillors from whom the Lord Mayors of London are selected. 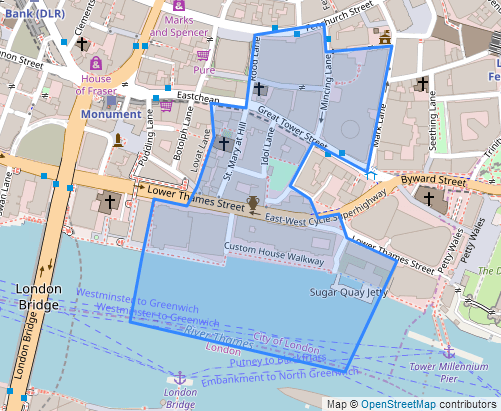 The City’s elections are dominated by business voters, and the business voters in Billingsgate ward are dominated by the insurance industry; however, there are only 258 voters on the Ward List (the electoral register) and turnout is likely to be low. In the 2017 City elections the two winning candidates, Michael Welbank and Robert Ingham Clarke, polled 42 and 40 votes respectively; Welbank resigned last year and his replacement, College of Arms herald John Allen-Petrie, won a four-way contest with 40 votes out of 90. This time there are six candidates whom I shall take in ballot paper order. Jonathan Bergdahl, an HR and operations professional, is the only candidate with a party nomination – for that eighties throwback the Social Democratic Party. The continuing SDP is a rather different beast these days to the party founded by the Gang of Four all those years ago; apart from anything else, it’s a very Eurosceptic group now and that’s unlikely to go down well with the City electorate. James de Sausmarez is an investment manager and Common Councilman for Candlewick ward. Andrew Heath-Richardson works in property development and regeneration, and had a major role in the building of the “Walkie Talkie” skyscraper on Fenchurch Street, which stands just outside the ward boundary. Rachel Kent is an advisor to the financial services industry specialising in regulation. Bronislaw “Bronek” Masojada is in the unusual position of having involvement in both elections today as he lives in Woldingham, Surrey; Masojada has since 2000 been the chief executive of the insurers Hiscox. Completing the ballot paper is Alpa Raja who has had several goes at standing in City elections recently, including in last year’s Billingsgate by-election where she finished third; Raja is an insolvency practitioner and chartered accountant.